This course does for spacecraft design what Daniel P. Raymer’s aircraft design short course has long done in that field: provide an entertaining and extensive introduction to the field from an industry perspective and through the use of a cohesive set of design and analysis methods. Topics include the basics of spacecraft and launch vehicle design, orbital mechanics, space and atmospheric flight, propulsion, structures, and systems design. 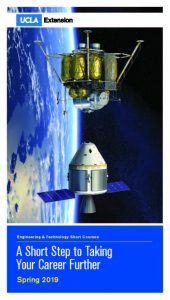 Instruction also includes an entertaining historical perspective and overview of current launch systems and spacecraft. This course evolved from lecture notes Dr. Raymer developed while teaching at California State University, Northridge, and at NASA-Glenn. It has been presented several times at Boeing’s Delta Launch Vehicle engineering facility. The course de-emphasizes the chemistry and thermodynamics aspects of rocketry, and instead focuses on the overall vehicle system design process. All material is presented starting from first principles and should be accessible to anyone with a basic engineering background. A copy of all lecture charts plus an Excel spreadsheet for calculating launch and interplanetary trajectories and their propellant mass requirements are distributed on the first day of the course. These materials are for participants only and are not for sale. Daniel P. Raymer, PhD, President, Conceptual Research Corporation, Sylmar, California. Dr. Raymer is a recognized expert in the areas of aerospace vehicle design, configuration layout, computer-aided design methodologies, and design education. He has consulted for numerous companies, including the RAND Corporation. His previous positions include director of advanced design at Lockheed; director of future missions at the Aerojet Propulsion Research Institute; and project manager of engineering at Rockwell North American Aviation. Dr. Raymer is the author of the best-selling text, Aircraft Design: A Conceptual Approach (AIAA, 1999); has published more than two dozen articles; and holds three U.S. patents. He regularly teaches short courses in aircraft conceptual design, advanced aircraft design, and aircraft design management, requirements definition, and system engineering. He has received both the Rockwell Engineer of the Year and the AIAA Summerfield Book awards. Dr. Raymer was presented with the Purdue University Outstanding Aerospace Engineer Award, given “to honor those alumni who have distinguished themselves in the aerospace industry.” He is a regular forum speaker at the EAA AirVenture (Oshkosh), and is an active private pilot.